VISTA — Capt. Robert A. Sulit was awarded the Bronze Star Medal on Aug. 17, 30 years after his military retirement and 70 years after earning it for his meritorious and heroic service during World War II. 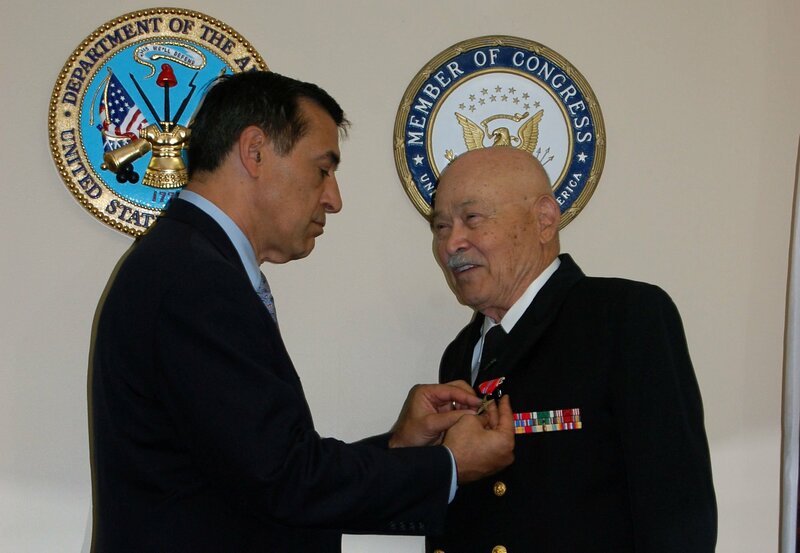 Surrounded by family, the 89-year-old Del Mar resident was presented the fourth highest individual award in the U.S. military by U.S. Rep. Darrell Issa in the congressman’s Vista office. Sulit, a retired Navy captain, was 18 years old when he was drafted out of high school into the U.S. Army and sent to fight in the European Campaign during his service from 1944 to 1946. His first job as a member of Company A, 69th Armored Infantry Battalion, 16th Armored Division was to dig out and clear mines on top of the cliffs at the Atlantic Wall. He said one member was selected from each squadron for mine clearance. They spent the first two days learning to identify and clear the mines. The third day was spent with the chaplain, praying, going to confession and receiving Communion, Sulit said. They blew up the mines on the fifth day. He said he used his regular trench knife to dig them up. He next traveled to Frankfurt, Germany, where he had his first combat experience driving through a village on a half track. “People were shooting at us,” he said. Sulit, who served as a machine gunner on a half track, said he aimed his weapon up and engaged the enemy. “I think I got somebody,” he said. Following the war Sulit took advantage of the G.I Bill and attended college. In 1957 he was commissioned as an officer with the Navy Reserves, where he worked as a nuclear physicist until his retirement in 1985. Shelly Sulit, his wife of more than six years, said her husband reads quite a bit of war history. While doing so recently he learned he could be eligible for the Bronze Star, which is awarded to any person who, while serving in the U.S. Army after Dec. 6, 1941, distinguished himself or herself by heroic service. She wrote to the Army Personnel Office but four weeks went by without a response. Someone suggested she contact Issa, her congressman. Within two weeks she received confirmation her husband was due the honor. Issa said Sulit waited a lifetime for something he had earned and thanked him for “clearing successfully.” He also said the events leading up to the ceremony were a result of no small effort by Sulit’s wife. “Never give up when someone has earned something,” Issa said. In addition to the Bronze Star Medal Sulit also received the Army of Occupation Medal, which was created after World War II to recognize those who performed occupation service in Germany, Italy, Austria or Japan. Issa also presented him with his first Challenge Coin, a small medallion symbolizing unit identity.